Girls' Dresses, Flower girl Dresses, Girls Holiday Dresses, Little Girls Dresses Blog: Halloween around the world! Halloween is one of the many occasion kids and grown-ups look forward to. They play dress up and go treat or treating during Halloween. But in other countries, people spend their Halloween in the cemetery to visit their departed loved ones. Below are different Halloween celebrations from different countries. In the Philippines, Halloween is celebrated during November 1 and 2. They call it "All Souls Day". They pay homage to their dead loved ones. Filipinos spend their day in the cemetery. Families would gather and eat together in the cemetery, some would even offer food to their dead and pretend he is with them. 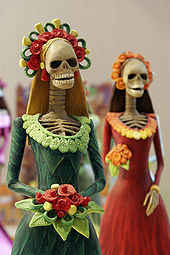 Mexico celebrates Halloween in November 2 and calls it Dia de los Muertos (the Day of the Dead). Dia de los Muertosis a week long celebration and is a mixture of Aztec and European tradition in which the soul of departed returns to the realm of living. In Japan, the day of the dead is called "Obon" and is celebrated in August . And just like in Mexico, the spirit of the dead return to visit their loved ones. And like in the Philippines, they offer food for their dead loved ones and place it on temples and their homes. 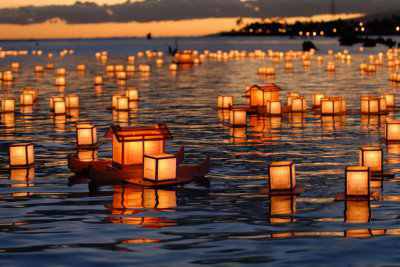 They also call "Obon" as the Festival of Lanterns because people send the spirit back to the world of the dead by sending paper lanterns down their river. In China, there isn't much happening during this occasion because Halloween is a non-event for Chinese people. Although, you will see some pumpkins and Halloween decorations on shop windows but this is just a great gimmick for the shop especially to those who sells western stuff and for bars who wants to attract foreigners to their bars. Halloween will be a it festive in larger cities but you wont see little girls wearing girls party dresses as costume or boys as vampires or pirates while asking for candies.